BHP Billiton in Western Australia is in a phase of vigorous activity in resources mining and associated activities. Support facilities have experienced capacity and performance problems. As specialists in logistics planning, supply chain consultants Hendersons were called upon for a strategy development project to advise on location of facilities, warehouse design and related supply chain matters. The initial brief was an assessment of warehouse resources at Mount Newman and Port Hedland to quantify limitations in warehouse layout at each site. Issues appraised included supply chain planning, installations in the current facilities and materials handling throughout. Recommendations were then made on options for expansion of existing buildings or replacement facilities at each site to accommodate growth. Following consideration of these recommendations, Hendersons were engaged for the Stage 2 project. 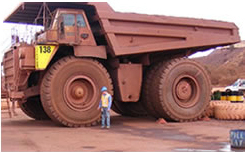 This comprised detailed logistics planning at Mount Newman and Port Hedland. Reorganised facilities at each site were designed in relation to warehouse layout with capacity estimates and materials handling solutions to installation quality for all stores. These included mining equipment spares, rolling stock and all other requirements for support at each site. As a further project, logistics consultants Hendersons were called on to conduct a similar warehouse design task at remote Mining Area C north of Mount Newman. Consulting time was spent on site to establish supply chain planning requirements and to develop spare parts distribution centre layout for upgrade of the facility capacity. In carrying out these significant projects for BHP Billiton, logistics consultants Hendersons transferred senior consultants from their Sydney Head Office to the sites. Considerable time was spent in supply chain planning and warehouse design at each of the regional locations and at BHP Billiton Corporate Offices in Perth.